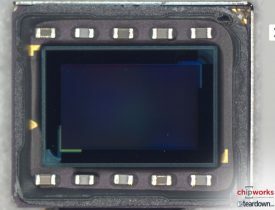 It looks like apple is continuing to use Sony sensors in their latest iPhone according to Chipworks‘ teardown. “iPhone 7’s FaceTime camera resolution has been bumped up to 7 MP. 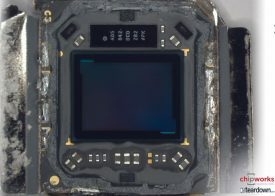 The front-facing Facetime camera module is 6.8 mm x 6.0 mm x 4.3 mm thick and contains a Sony Exmor RS chip, also featuring 2nd generation TSVs. Our preliminary analysis of the 5.05 mm x 3.72 mm (18.8 mm2) FaceTime camera chip reveals a 1.0 µm pitch Bayer RGB CFA. This entry was posted in Press releases and tagged iPhone 7. Bookmark the permalink. Trackbacks are closed, but you can post a comment.